By now you’ve watched me argue against the common reasons people fail to seek green certification on their home, and you’ve read my follow-up detailing common problems that can happen in homes that don’t bother to certify. Intrigued, hopefully you’ve then gotten a better understanding of the process of getting a green certification. Now all that’s under your belt, it’s time to look at the most common green certification programs available today, in detail, so you can pick the program that you want to follow when you build your own dream green (certified) home. These programs take one or two areas of green building that are of most concern to the most consumers, and focus on key best practices to achieving those goals practically. Style: Checklist, with a target HERS Score as one of the requirements. Availability: Nationwide, but, easier to find participating builders and HVAC contractors in cities than in rural areas. As of 2017, over 80,500 new homes have been Energy Star certified nationwide. Only available on new home construction. Green Focus Areas: Energy efficiency, with a few requirements that also touch on indoor air quality and durability. Rater to inspect home during framing, insulation, and final, and to do the HERS Rating. Fresh air ventilation is required. Availability: Nationwide, but, easier to find participating builders in cities than in rural areas. 14,053 certified homes nationwide as of May 2018. Only available on new home construction. Green Focus Areas: Indoor air quality. Some requirements overlap with Energy Star. These programs look at green building through a wide variety of lenses, considering the environmental impact of many aspects of construction and the built environment. 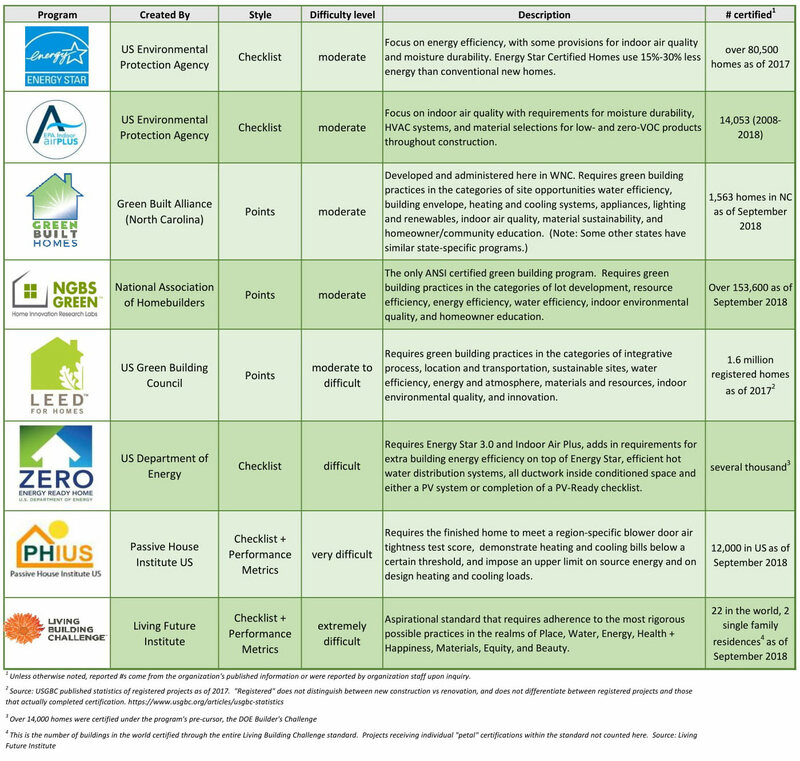 Homes certified to these programs offer a reduced environmental impact in a number of different ways, while still delivering science-backed, common sense energy efficiency and indoor air quality performance. Style: Points system, with levels Certified through Platinum available depending on total # of points earned. Created and Administered By: The US Green Building Council, a non-profit. Availability: Nationwide, but easier to find participating Raters in cities than in rural areas. According to the USGBC, as of 2017 there are more than 1.6 million residential projects registered or certified with LEED, though this does not separate how many are registered but never finish certification, nor does it separate new construction from renovation. More common on large, architecturally designed homes than on smaller single-family home projects, due to complexity of requirements. Commercial, multi-family, renovation and retrofit LEED programs also exist. Focus Areas: Points available in the categories of sustainable sites, energy efficiency, indoor air quality, material selection, water efficiency, waste reduction. Points awarded for Low HERS scores. Some credits are required, others are optional. In a Nutshell: There is no one path to a LEED certified home; however, having a builder and architect familiar with the program is a big help. A Rater certified through the USGBC to administer LEED is required. Points awarded for professionals on the project team who are accredited through LEED. Because the requirements are all-encompassing, it is best to get started very early—in fact, LEED offers points for having early, regular meetings with the builder, owner, architect, LEED Rater, and other interested parties such as structural or mechanical engineers. Some of the requirements are targeted at high end, architecturally designed custom homes and are impractical to implement on more common sized residential new construction. Since throughout the US, many small or mid-sized single family residential projects do not involve an architect, LEED for Homes is more common in markets or geographic regions where an architect is typically used. Projects without an architect might consider alternate programs. Note: Checklist and detailed information on credits must typically be purchased from USGBC. Style: Points system, with levels Bronze, Silver, Gold or Emerald available depending on # of points earned. Created and Administered By: Created by The National Association of Homebuilders, now administered by Home Innovation Research Labs. Availability: Nationwide, but easier to find participating Raters in cities than in rural areas. According to the program website, over 153,600 homes have been certified nationwide as of this writing. Certification is available for new homes, multi-family construction, remodeling, or developments. Focus Areas: Points available in the categories of lot development, resource efficiency, energy efficiency, water efficiency, indoor environmental quality, and homeowner education. In a Nutshell: The NGBS is the only green building program that is ANSI certified, which means that the process for creation and revision is reviewed and developed through a public comment process. Project must be inspected by an NGBS certified Rater. Like LEED, the pathway to certification varies based on the points chosen. There are mandatory requirements in the realm of energy efficiency, air quality, and moisture durability that are relatively similar to the Energy Star program. Points are available for a wide variety of additional practices. Points awarded for low HERS scores. Choosing products pre-certified to comply with NGBS makes the selection process for earning points easier. Style: Points system, with levels Certified, Bronze, Silver, Gold, and Platinum available based on # of points earned. Created and Administered By: The Green Built Alliance (formerly the Western North Carolina Building Council), a green building non-profit serving Deltec’s home Asheville and Western North Carolina community. Deltec Homes is a supporting member of the Green Built Alliance. Availability: North Carolina specific program. Available throughout North Carolina, but concentrated here in WNC. As of this writing there are 1563 Green Built Homes in North Carolina. Green Focus Areas: Points available in the categories of site opportunities, water efficiency, building envelope, heating and cooling systems, appliances lighting and renewables, indoor air quality, material sustainability, and homeowner/community education. Net Zero Certification also available for Green Built Homes that achieve a HERS score of 10 or less. In a Nutshell: Requires either Energy Star for Homes or the NC 2012 HERO Code as a baseline. Requires fresh air ventilation, carbon monoxide detectors, erosion control planning, appropriate ventilation for combustion appliances. Offers additional points for many other green building practices. Developed by a team of builders, homeowners, and HERS Raters in NC to reflect green building practices common to the area and most beneficial in our particular climate. A good choice for an all-around green certification program as an alternative to LEED, for smaller and less complex projects that don’t necessarily have an architect. There are many other regional programs developed by state-specific green building organizations, typically with similar program structures, such as EarthCraft Homes available in Georgia and Virginia, or the Florida Green Building Standard available in Florida. Regional programs are often good alternatives, as they have more contractors in the area familiar with the requirements and may be more tuned to the intricacies of the best practices in that specific climate zone. These programs push projects toward the current cutting edge of difficulty, innovation, and greatly reduced environmental impact. Success with these programs requires commitment to lofty environmental or energy goals, and have the potential to make the most difference on the built environment by requiring innovative practices that may be well above the construction norm in most areas. Due to their difficulty level, they are less common, and do tend to incur higher costs over standard construction practices. Availability: Nationwide, but, easier to find participating raters in cities than in rural areas. Released in 2014, there are several thousand homes currently certified, with 10 thousand currently in the pipeline through builder and developer plans, according to program staff. Available on new home construction only. Focus Areas: Though the main focus is on homes built in preparation for solar energy use, this program requires the most advanced green building practices in many areas. Energy Efficiency, Indoor Air Quality, Efficient Hot Water Design, and design for solar are required. In a Nutshell: ZERH is designed to require—and showcase–the most advanced building sciences practices commonly possible in new construction, throughout the home. It is meant to be the next step up from Energy Star certification. The program consists of one checklist, but this checklist requires getting other Energy Star for Homes AND Indoor Air Plus certification while you’re at it. In addition, above code insulation, duct systems located within conditioned space, efficient hot water distribution systems, high efficiency lights and appliances, and a PV-ready checklist must be completed. 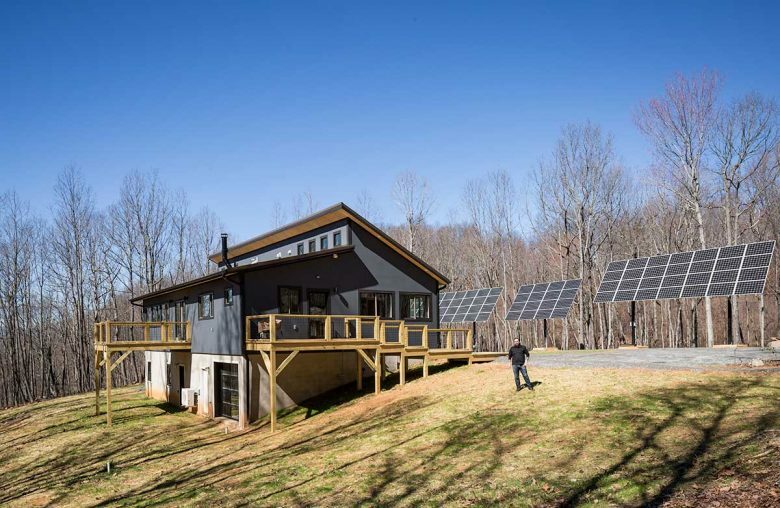 My company, Deltec Building Company, is working right now on our first Zero Energy Ready Home project, which will be the first home to achieve such certification in Western North Carolina. Stay tuned here for more updates as I write about our progress and learning opportunities as we embark on this challenging and exciting new step in green building! Style: Performance standard. Specific energy use metrics must be met when the home is finished, it is up to builder/designer what to do to achieve those. However, the metrics are very challenging. Passive House (the original German standard) uses one set of metrics for any location, while PHIUS+ (the US version) uses regionally-adjusted metrics based on your US climate zone. Created/Administered By: The Passive House standard was created by the Passive House Institute, a for-profit in Darmstadt, Germany. The PHIUS+ standard belongs to Passive House Institute US, a non-profit. Availability: Both are available worldwide. Rare overall, and more common in colder regions. According to the Passive House Institute US, there are least 1,200 registered or certified PHIUS+ projects in North America as of this writing. Focus Areas: Greatly reduced energy usage through passive means: reduced thermal bridging, super-insulated and exceptionally air-tight construction, high performance windows, passive solar heat gain, and heat recovery ventilation. In a nutshell: PHUIS+ and Passive House both originated out of the study of passive home design, and arguably represent the most stringent energy performance standards for homes. The two programs are similar to each other in structure and philosophy, but are separate programs run by separate institutes. PHIUS+ is more adapted to the particular climate zones of the United States, which can have vastly different considerations than the climate of Germany where the original Passive House (Passive Haus) standard was developed, and thus I recommend PHIUS+ over Passive House for projects in North America. A PHUIS+ certified Rater must be used to certify the home. PHUIS+2015 Certification includes following all requirements for Energy Star, Indoor Air Plus, and DOE Zero Energy Ready Home Certification—not a bad collection! And it adds in a few climate-specific performance metrics that must be met: an air-tightness score, an upper limit on total source energy use, an upper limit on heating and cooling loads, and an upper limit on heating and cooling actual energy use. These limits are very challenging: typically double-stud walls or other high R-value walls, triple pane windows, and other super-insulation strategies, along with south-facing passive solar design, will be necessary to qualify. Because actual energy use is one of the metrics, certification cannot be guaranteed until after the home has been built and lived in for a period of time and can demonstrate energy bills that meet the requirements. Style: Checklist, with all requirements mandatory in all categories (called “Petals”) to earn Living Building Certification. However, individual “Petal” certifications which reward following all requirements of just one of the categories are also available, as are sub-certifications in other specific focus-area certifications such as Net Zero or Zero Carbon. Created and Administered By: The Living Future Institute, a non-profit. Availability: Worldwide, but extremely rare. As of this writng there are only 22 buildings in the world certified under the full Living Building Challenge, only two of which are single family residences. However, a handful of homes have achieved individual “Petal” certifications, or Net-Zero certification. Green Focus Areas: Requirements in the categories (“petals”) of Place, Water, Energy, Health + Happiness, Materials, Equity, and Beauty. In a Nutshell: What if every possible green building practice were followed to the very highest fulfilment? That is the challenge within the Living Building Challenge. Every single requirement is the most advanced possible (or sometimes, surpasses what is currently possible) by human engineering and architecture. Living Building homes must be net-zero in source energy without using combustion, contain not a single toxic chemical, be architecturally beautiful and connected to the local environment, have net-positive water use…among many other things. As such, it is an aspirational, rather than practical certification. But the idea is to push the built environment to and past the very limit of what’s possible, to expand how we think about buildings and their interaction with the environment and demand that what we do only bring about positive change. What programs are right for you? With so many programs to choose from, it’s hard to avoid getting overwhelmed. My advice is to consider your goals. If you just want a house that’s notably energy efficient and like the idea of green certification primarily for the quality assurance of your build, Energy Star is a great, science-based program that gives you a solid house, plus it’s a program that has wide national recognition. If indoor air quality is a big concern to you, add in Indoor Air Plus. If green building on a broader level motivates you: not just energy efficiency and air quality but reduced environmental impact in all aspects of the home, consider the National Green Building Standard, or a regional program if there’s one in your area. These programs can help you really reduce the environmental impact of your home on so many fronts. And if you want to build a very challenging, super energy efficient house that goes well above and beyond the norm, DOE ZERH or Passive House US offer high bars to set yourself against, giving you the opportunity to use your home project to advance the entire green building industry.